James Haigh, director of the International Master in Tourism & Hospitality Management at EADA, interviewed Evangelia Baralou from partner institution Alba Graduate Business School in Greece. Each year, the Tourism & Hospitality class takes part in an International Business Trip, and for the last 2 years, Alba has welcomed EADA’s students to its Athens campus. The Trip consists of classes undertaken in the Alba Athens campus covering marketing management, managing people, sustainability and trends in Greek tourism. Participants then embark on a 3-day visit to the 5* Westin Resort, Costa Navarino, leader in sustainable tourism. In the interview, Evangelina talks about Alba’s ongoing collaboration with EADA and the unique perspective that the International Business Trip offers EADA students. James: How would you describe your role in Alba? Evangelia: I am the academic director of the Master in Tourism Management, which has been running since 2014. I also teach in the programme, I manage the internship programme, and I am involved in curriculum design including all of the activities that take place outside the main curriculum. James: Can you tell us a bit about your background? Evangelia: I have a background in computer science, and my research is based on technology use in tourism organisations and virtual teams, organisational arrangements that transcend traditional boundaries of space and time. That is basically what I do: research the issues in my areas of expertise, and design and manage the Master in Tourism Management here at Alba. James: From your point of view, what is the advantage of collaborations like that of Alba and EADA? Evangelia: I think that this collaboration is a great opportunity for all of us – we can all learn from each other. For students, it offers them the chance to mix with participants from another leading institution. Outside of the classroom, EADA students can take advantage of Alba’s resources such as the internship programme. We are already considering a joint business trip to Barcelona or another tourist hub, providing an additional opportunity for students from both schools to grow their network. 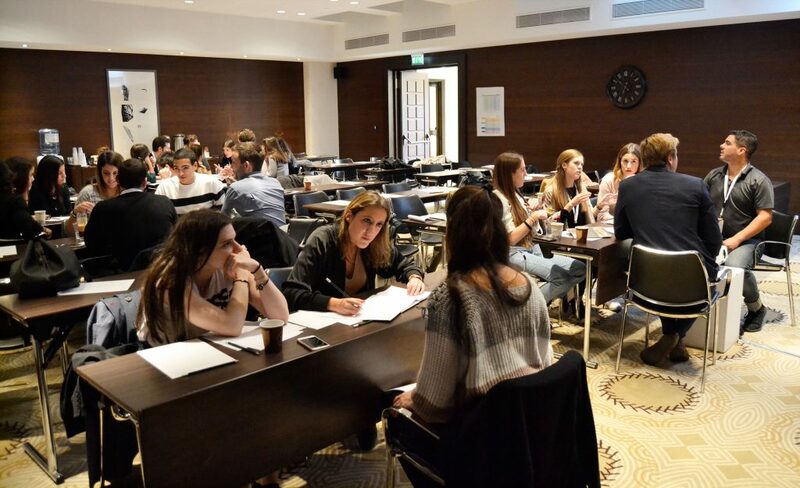 Participants from EADA and Alba work together at Costa Navarino to analyse the challenges and successes of the international tourism industry. James: Without a doubt, it is enriching for participants of both programmes to get to know and learn from each other, and specifically, to learn from such a practical experience like the one in Costa Navarino. In your opinion, what is the added value of this type of international business trip? Evangelia: The global perspective on tourism that participants acquire. When we discussed the opportunities and challenges of the Greek tourism industry with EADA students, we found that countries all over the world were facing similar situations. A trip like this one broadens participants’ perspective and introduces them to the industry on a global level. The experience is an eye opener and it gives participants the opportunity to learn –in the real-life context of a luxury resort– what it means to offer this level of service. James: I agree. A lot of our students have a very good understanding of the industry on an operational level, but in order to excel as managers, they need to build on that understanding to develop a broader, global perspective. Evangelia: You’re right. And being here in a particular country with a particular culture gives them a vision of what it takes to offer high service in a large-scale resort like Costa Navarino. Some students come to us with an idea of what is needed to manage a hotel, but they are often surprised by what they see in the “real” industry. For participants, the experience is an eye opener and it gives them the opportunity to learn –in the real-life context of a luxury resort– what it means to offer this level of service.